Koyama Press’ spring lineup of titles features a huge variety of different genres and styles, but Ben Sears’ Night Air is the only book aimed at an all-ages audience. 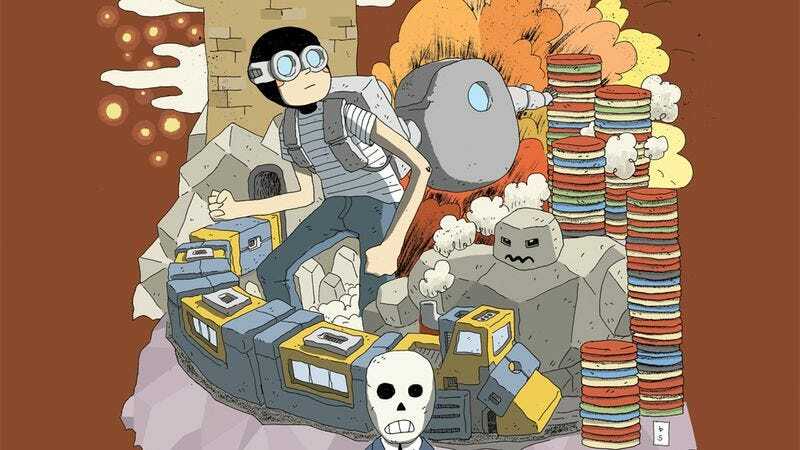 Starring a young boy and his robot on a mission to find the treasure hidden deep within a haunted house, the new graphic novel showcases the craft and character that make Sears such a compelling cartoonist, as evidenced by the bold designs, immersive compositions, and atmospheric colors of these preview pages. The establishing shot of the haunted house is both ethereal and ominous, and Sears’ dramatic architecture design is one of the most exciting visual elements of Night Air. He has a remarkable talent for creating a strong sense of place, and each new location the characters enter has its own distinct feel, helping the reader get a stronger sense of the characters’ experience in the moment. Sears’ artistic strength is paired with a sharp sense of humor that makes for an especially engaging read, and readers can dive deeper into Night Air when it hits bookstores at the end of this month.